The United States has reclaimed the Walker Cup with a 19-7 victory over Great Britain and Ireland at The Los Angeles Country Club. The biennial matches series has seen numerous classic finishes no more so than in 2015 at Royal Lytham and St. Annes when the US lost 16½ to 9½ in a rare defeat. Overall the USA leads the series, which dates back to 1922, by a count of 36-9. The United States’ team was captained by Spider Miller in his second and last run at the helm. It had three players Maverick McNealy, Doug Ghim and Collin Morikawa who went 4-0 this year, a result which has never been accomplished in a Walker Cup. “I think it starts with the US team getting that big trophy and that was our goal at the beginning of the week and I’m so excited to be part of the 2017 winning Walker Cup team,” said McNealy, who also boasts 11 collegiate tournament victories during his tenure at Stanford to match Tiger Woods’ achievement and is set to turn pro next month at the Safeway Open on the PGA Tour. In three Walker Cups, the USA had two players post 4-0 records – 1977 (John Fought and Lindy Miller), 1997 (John Harris and Brad Elder) and 2009 (Peter Uihlein and Rickie Fowler) – and GB&I achieved it once in 1999 (Luke Donald and Paul Casey). The 19 points ties the record for the most that have ever been scored by a single team in a Walker Cup and is the most the USA has put up since 1993. The Americans came into Sunday’s double session of four foursomes and 10 singles matches with an 8-4 advantage, and instead of faltering to allow GB&I to narrow the lead, they built on it. 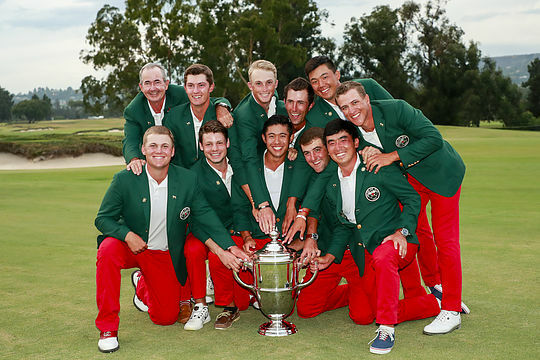 The USA went 3-1 in foursomes and 7-1-2 in singles to build a comprehensive winning margin. The R&A has announced that it is to consider extending the Walker Cup from two days to three, to bring it in line with other major team trophy events. The Ryder Cup, Solheim Cup and Curtis Cup are all contested over three days, but so far the R&A has remained resistant to arguments from the USGA, its fellow governing body, that the oldest match of the four should follow suit. The 47th Walker Cup Match will take place Sept. 7-8, 2019, at Royal Liverpool where the USA will look to win for the first time on UK soil since 2007. Can Jason save the Day at Presidents Cup?